There is no ‘secret plan’ to shut down South Tyneside Hospital, health chiefs have promised. Concerns have been raised about the future of the hospital, in Harton Lane, South Shields, because plans for changes to the services it will deliver - and closer links with Sunderland Royal Hospital next year. But members of South Tyneside Clinical Commissioning Group (CCG) have poured cold water on suggestions it could lead to a downgrading of South Tyneside. “This is not a long term plan to have just one hospital in Sunderland,” Paul Morgan, a lay member of the group, told its governing body. “Anything we do has to show that the plan is to retain two hospitals and we, as South Tyneside CCG, have to be satisfied of the benefits. “There are services that will take place locally, rather than having to go to Sunderland and I want to see things that emphasise that. CCG chief executive David Hambleton backed the plan to reform health care in South Tyneside. Bosses at the City Hospitals Sunderland and South Tyneside Foundation Trusts, which run the hospitals and which already share a chief executive, have said they expect the merger to save about £8m by 2022/23. Due to be finalised by April, the new trust will be responsible for 675,000 patients in Sunderland, South Tyneside and parts of North Durham and employ more than 8,500 workers. But campaigners at the Save South Tyneside Hospital group have have accused the trusts of failing to consult properly with patients, public and staff and claim it will see services shifted away from South Tyneside. The merger does not directly affect clinical services, only organisational structures, so is not subject to a full public consultation. However, changes to areas such as stroke, maternity and pediatric care through the controversial Path to Excellence proposals are currently being challenged through a judicial review. 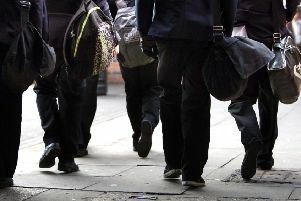 However, a request by councillors from Sunderland and South Tyneside for the plans to be shelved was rejected by the government following an assessment by an independent panel over the summer. Consultation on a second phase of the Path to Excellence scheme also began earlier this year.